Do you ever daydream about the perfect muffin? Ok, maybe that’s just me. I love to create new recipes that create “oohs” and “aahs” from my family. 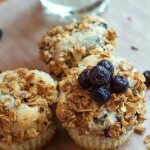 These blueberry cheesecake muffins with granola topping have just done that! Plus, they make the perfect teacher or neighbor gift — gotta love that! I have a fun kitchen. It’s always hopping. In our kitchen you will my daughters, my son, my husband or me creating a new recipe. Everyone has their “specialties.” Muffins are something that are near and dear to my heart, so of course I keep tweaking my recipes to make them even more moist. And of course, I always strive to create the perfect blend of sweet and tartness! My husband, on the other hand, is a HUGE cheesecake fan. I have made several versions of cheesecake just for him, but I thought a blueberry cheesecake muffin would be the perfect match for our family. Muffin and cheesecake lovers will agree on this amazing recipe that’s not a lot of work to whip up! Psst! I have a confession to make. Any excuse to eat cheesecake for breakfast will drive me to get up early and bake these gorgeous, colorful muffins. Plus, I LOVE how they make my entire house smell! But, if you don’t like to get up early and bake, there’s still good news! These muffins are perfect for baking the day or night before and then quickly serving them for breakfast, or enjoying them on-the-go. I also love snagging one from the fridge for a sweet treat in the afternoon. If you’re not a muffin specialist, here’s a few sneaky tips to amazing muffins. Don’t overheat the batter. I know you want to do a good job on these gorgeous muffins, but sometimes you just need to follow the directions, and not go above and beyond the call of duty. So when the directions on muffin recipes say mix until just blended, do just that. Don’t continue mixing for 5 or 10 minutes. Keep it moist. The secret to a moist muffin is using the right amount of oil or butter. Do not skimp on this ingredient, but don’t use too much either! Be gentle with the extra ingredients. Chocolate chips, blueberries or nuts should always be stirred in gently and patiently. Just a few stirs will do. Don’t over-bake! For years my cakes and muffins were dry. I asked a friend who made some amazing cakes and she told me to pull the cakes out of the oven before I thought they were completely done because they would continue to bake in the pan. Keep an eye on your baked goods, but take them out of the oven before they reach a rich golden brown. I go for the lighter golden brown to keep in all that yummy moisture! 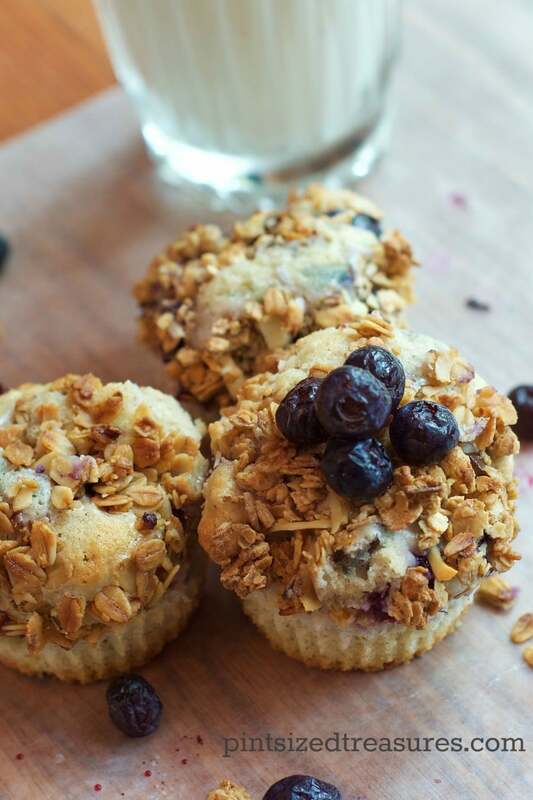 Grab the dreamy, super blueberry muffin recipe below! 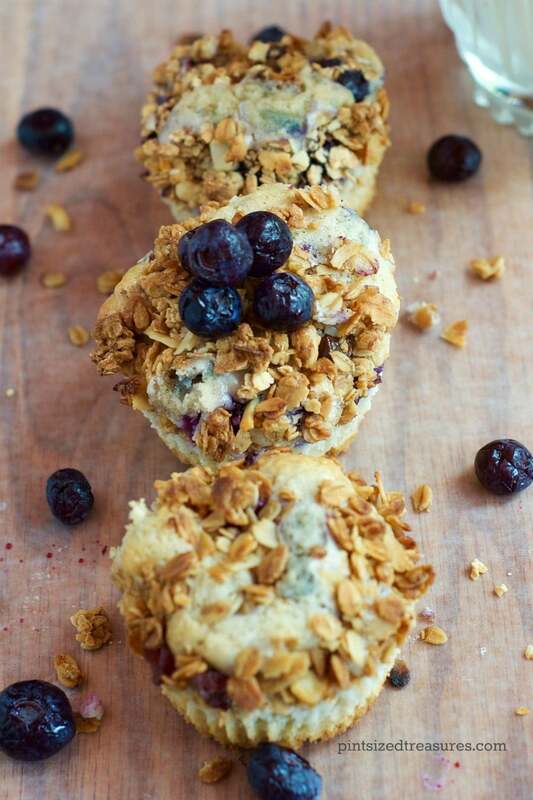 Gorgeous blueberry cheesecake muffins are the perfect excuse to eat cheesecake for breakfast! Mmmm! In large bowl, cream butter and one cup sugar until light and fluffy. Add two eggs, one at a time, beating well after each addition. Beat in milk. In another bowl, whisk flour, baking powder and cinnamon; add to creamed mixture just until moistened. Fill 16 greased or paper-lined muffin cups one-fourth full. For filling, in another bowl, beat cream cheese, 1/3 cup sugar and one egg until smooth. Add a tablespoon of cheesecake into the center of each muffin before baking. Stir granola into 1/4 cup of honey until completely incorporated. 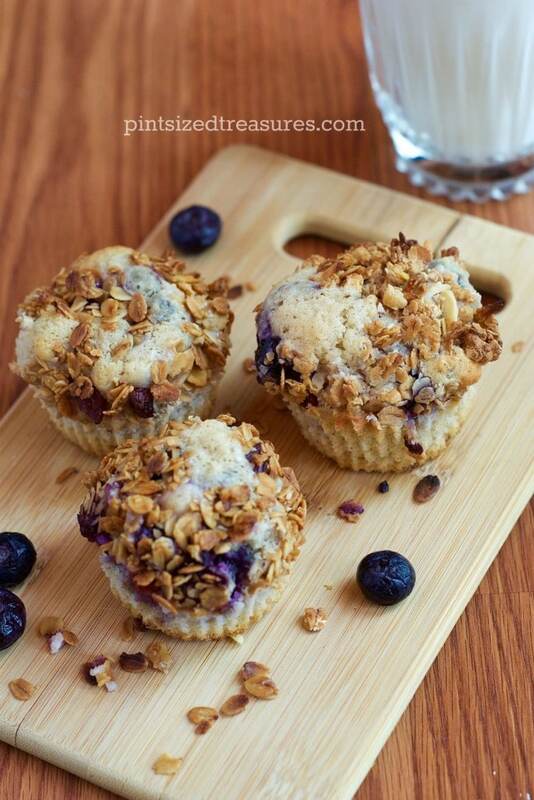 Spoon one teaspoon of granola mixture on top of each muffin and gently press the granola into the muffin. Let muffins cool for about 10 minutes before removing from muffin pans.